Vaillant boiler manufacturer - a producer of the high-quality, high efficient equipment for domestic hot water and space heating that offers a great range of models and sizes for almost any home and application. Vaillant is the German manufacturer, family-owned and world leader in the HVAC industry. Vaillant was founded in 1874 and today, with the 13 sites and many selling offices and distributors has products that are present on all continents and in over 75 countries. The company offers many advanced products such as the condensing gas boilers from ecoTEC series that are the most popular and top-selling products in Europe; Germany, Austria, UK, Poland and others. 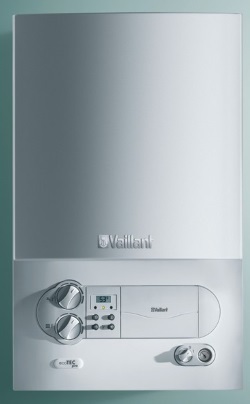 Vaillant’s state-of-the-art and ultra-efficient products are used in residential and commercial heating applications and can be found as; electric and geothermal heat pumps, water storage tanks, gas boilers and electric water heaters, floor-standing and wall-mounted condensing boilers, oil-powered boilers, solar panels, and controls. This review will cover the best of Vaillant; condensing gas boilers, heat pumps, hybrids and solar heating systems, used in residential homes, for low demanding and high demanding homes, also new and old houses. All these systems save a lot of energy and water and have very low NOX and carbon dioxide emission. The latest innovative technology and management systems, including the smart control systems, resulting in the optimum performance, reliable operation and comfortable use. Condensing boilers from ecoTEC series, utilize the heat energy from flue gases to provide an ultra-high efficiency of up to 98%. Vaillant boilers are also "green" due to the reduced emission of the greenhouse gases and its replaceable components. With the advanced features, water, gas, and energy consumption are also reduced, while the greater flexibility allows combination with the storage water tanks, solar domestic water heating systems (DWHS), heat pumps and small electric heaters. Vaillant ecoTEC boilers are designed as the combination, open vent, and system boilers, and to explore the difference and choose the right model for your home, check the ecoTEC boiler review here. Vaillant boilers that utilize the surrounding energy from the air or groundwater are getting more on popularity due to its environment-friendly technology, no pollution, and great energy savings. These are known as the heat pumps or hybrids and are represented by the aroTHERM model as the air-to-water type and geoTHERM as the geothermal heat pump model. Solar water heating systems from Vaillant are designed to operate as the stand-alone systems or combined with the gas, oil and electric heating systems, utilizing the free solar energy with the minimal pollution. There are two types of the solar heat collectors; solar panels (aeroTHERM VFK series) also auroSTEP drainback system and evacuated tubes (auroTHERM exclusive VTK series), both used in the heating of domestic water, swimming pool or central heating. From the electric water heaters, Vaillant offers instantaneous type, which heats water, as the name says, instantaneously. This type is ideal for point-of-service applications, such as under the sink, and if the central heating is not available such as distant sinks. The electric models can operate as the single unit or depend on the model, in combination with the water storage and solar water heating systems. Other interesting products that can be purchased from Vaillant Group include the intelligent controllers and cylinders, which are combined with the above Vaillant boilers. Vaillant is the family-owned company with the headquarters in Remscheid, Germany that operates worldwide and includes 13 manufacturing and R&D sites in Europe including Turkey and China. The Vaillant Group is the owner of the following brands; Saunier Duval, AWB, Bulex, Glow-worm, DemirDokum, Hermann Saunier Duval and Protherm.